Recently we returned to one of our favorite places in the world, Saba - a very small island in the Caribbean, close to St Martin. In many ways the best things about Saba are the things it doesn't have. There are no beaches, no golf courses, no casinos. The mass tourism and resort complexes that litter so much of the Caribbean have ignored Saba since it's too small and too hilly. As a result the island is wonderfully quiet and relaxed. The road, heading up from the airport to the village of Hell's Gate. 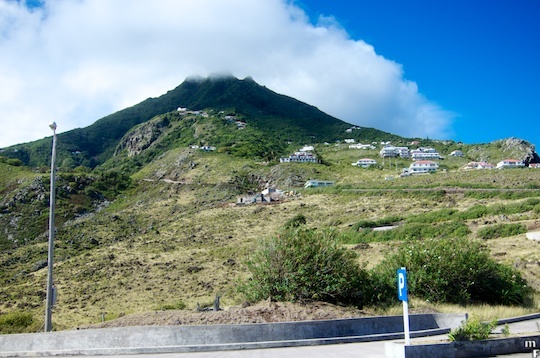 As a result only a few tourists go to Saba. For those that do the main activity is diving. 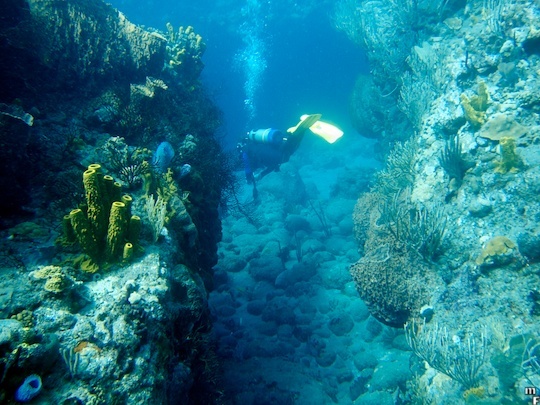 Saba is surrounded by coral reefs in a marine park, and the resulting diving is excellent. (However since the reefs are 30' and deeper, there is little for snorkelers.) Most of the diving is a short boat ride from the harbor, so you can take your surface time on shore and quickly get to the next dive site when you're ready. It was five years since our last trip there, and our favorite dive operation, Saba Deep, was under new management. Fortunately Cheri and Tony still have the same spirit of small boat dives that made us keep coming back. During the days we were there there was often only the two of us in the boat (indeed on one occasion there were three dive masters with the two of us). The team is relaxed, loves diving, and are very professional about it. Saba also has nice hiking trials that can fill a couple of days. The most popular gives you the irresistible opportunity to hike to the top of the tallest mountain in the Netherlands (around 3000 ft). 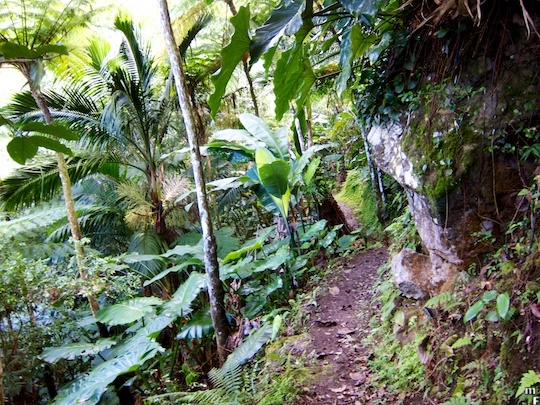 My favorite trail is the Sandy Cruz trail which loops around the rain forest on the north slopes of Mount Scenery. The island's vertical nature yields quite a few special stories. Such as the island's road. They got Dutch civil engineers to survey a road early this century and were told it couldn't be built. So one of the islanders took a correspondence course in civil engineering and the islanders built the road themselves. My wife (a structural engineer) appreciated both the road and the Dutch engineer's reaction - apparently that road would break just about every building code in the US. The airstrip is a similar story, it's the shortest landing strip you are ever likely to land on. Sit by right hand window and you'll swear that that wing will scrape the mountainside going in. But in 30 years there's never been an accident. Another new experience for us was to stay at the Queen's Garden resort. It's an extremely nice resort that does dive packages with Saba Deep and we'll be happy to return there again. They offer good food, and there's also good restaurants in Windwardside - we had good meals at Brigadoon and Eden. We don't expect it will be five years before we return.